Thank you for the stellar reviews! It has been my pleasure! I've been trying to figure out what happened to a certain Civil War ancestor for over a year. I recently stumbled upon Deidre's website and decided to give it a try. I couldn't be happier with this decision. 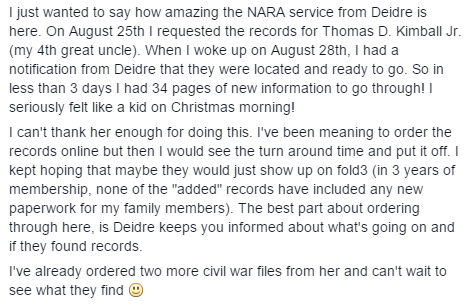 Deidre keeps you updated with what she's found throughout the whole process, and gives you a timeline of when you'll receive your material. Within a week of first contacting her I had 85 pages of digital documents in amazing quality. I will definitely be using this service again and highly recommend it to others. Thank you!